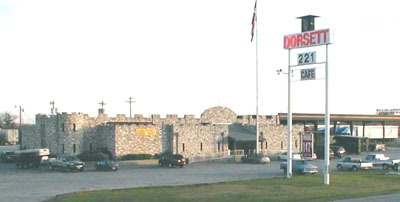 There is a castle looking structure on the east side of I 35 south of Austin north of San Antonio ( gas station). About the castle, Just south of Austin city limits. At exit 221 on the East side of Interstate 35. The structure seems to be built of lime stone. It faces West. But the best view is from the Northwest side. There is a sign outside- Dorsett. I don't think this really qualifies as a castle, but it's interesting, so I'll leave it on the webpage for a while. It was just a limestone façade on a truck stop but it has been torn down now. It was interesting to look at but apparently not profitable enough to stay unique. Hello there. I am actually one of many grandchildren (17) of Tim and Lenora Dorsett who started the Dorsett 221 Truck Stop in 1979. And yes, it does look like a castle. I was actually really surprised to see it on your website! This was one of the most popular places for truckers to come in central Texas as well as a nice place for families to stop in for dinner. It was a family business with all four of their son's running some part or another of the business. There was a parts department where they fixed trucks, a ditching department where they would, as you can imagine, dig ditches and a convenience store and gas station with a restaurant. (Ridiculously good chicken fried steak and breakfast tacos to die for!) We even had a game room. When my grandfather past away, all of the brothers decided to continue on with the family business. All was going well until there was a fire started in one of the restrooms that actually burnt a good portion of the inside. During the restoration, there were mixed feelings about what to do and they all agreed to sell out to one brother who unfortunately wasn't as successful as we had hoped in restoring the name and building back clientele. This is why it was shut down. Too much money being spent; not enough coming back. The ditching company is still in business and doing well by one brother. Another has opened a new truck and trailer sales division. And another has opened a second ditching and sign company. A family of entrepreneurs! I have to say though. My grandparents were amazing people and helped out so many people. They started Brown Santa and would go around with a Cowboy Santa giving gifts and food to the needy and were always involved in charity work. It may not be a "castle", but they definitely deserve to be noted as one of a kind pair that made a huge difference in a lot of peoples lives. I miss them dearly and when I drive by the truck-stop, I think of them. It is still standing but is vacant to date.